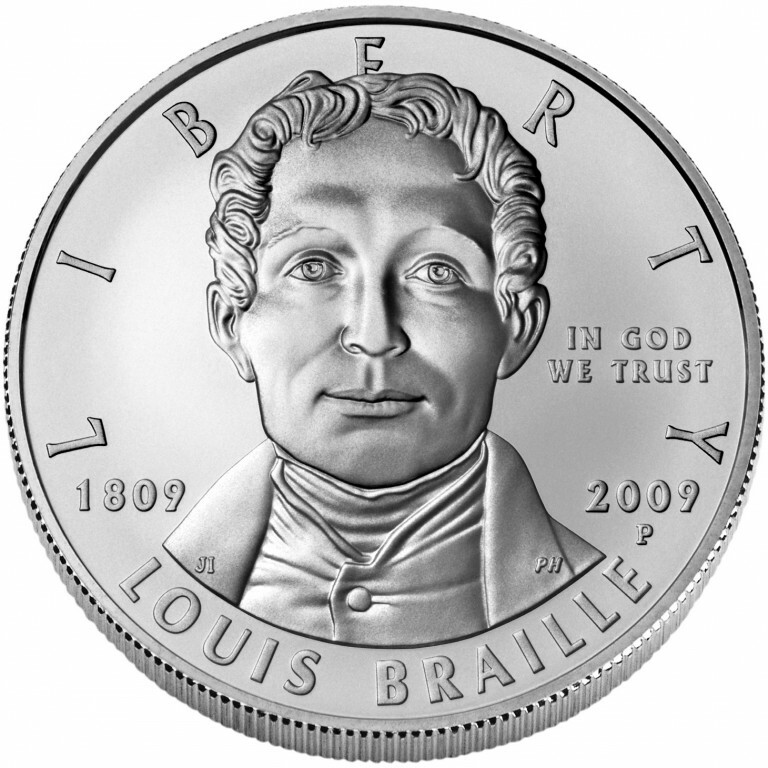 The 2009 Louis Braille Bicentennial Silver Dollar commemorates the 200th anniversary of the birth of Louis Braille, inventor of the Braille system, which is still used by the blind to read and write. Louis Braille was born in Coupvray, France, near Paris, on January 4, 1809. At the age of three, he lost the sight in his left eye as the result of an accident in his father’s workshop. An infection spread to his right eye and he became completely blind by the age of four. At the age of 10, Braille received a scholarship to attend the Royal Institute for Blind Children in Paris, where he became the youngest student. At the school, most instruction was oral, but Braille read books for the blind, which had large letters embossed on the pages. In 1821, a captain in Napoleon’s army, Charles Barbier de la Serre, visited Braille’s school and introduced a system he had invented called “night writing.” This was a method for communicating on the battlefield at night without having to talk or light a match, which could alert the enemy. It consisted of 12 raised dots which could be combined to represent words by sounds rather than letters. Over the next few months, Braille experimented with different configurations until he found a simpler one using just six dots. By the age of 15, using a blunt awl (the same type of tool that had injured his left eye 12 years earlier) to punch holes in paper to represent letters, Braille had developed the code that is essentially what we know today as modern Braille. It uses no more than six dots in a “cell” of two columns of up to three dots each to represent letters and contains a system of punctuation and “contractions” to speed reading and writing. It is read by passing the fingers over the raised dots. Today, Braille has been adapted to almost every known language and is used everywhere from bus stops and maps to music notation and text books. In his native France, Louis Braille’s achievement was recognized in 1952 – the 100th anniversary of his death – when his body was moved to Paris and interred in the Pantheon. 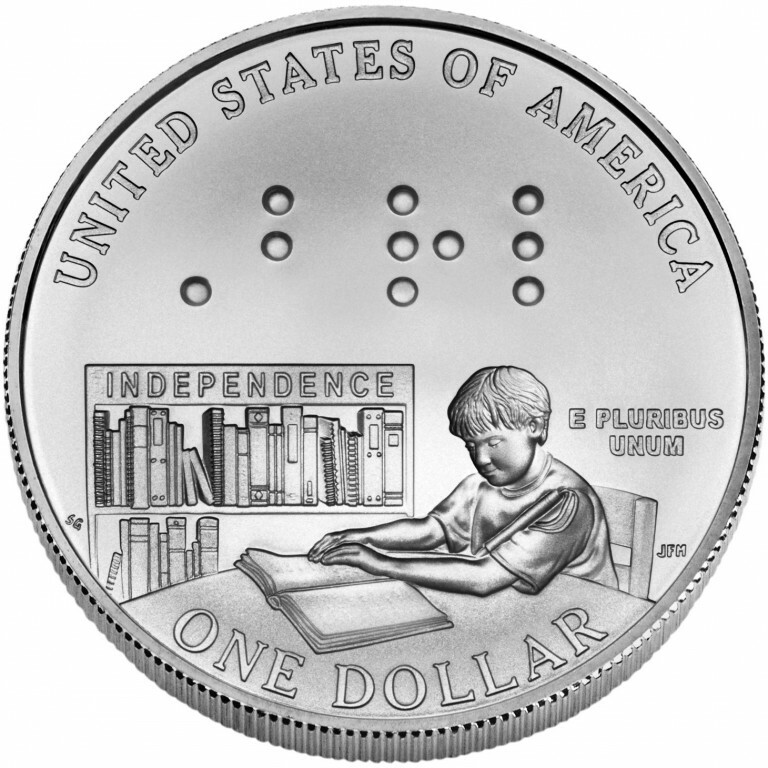 Now, for the first time in history, a United States coin features readable Braille. It is available in both proof and uncirculated versions. 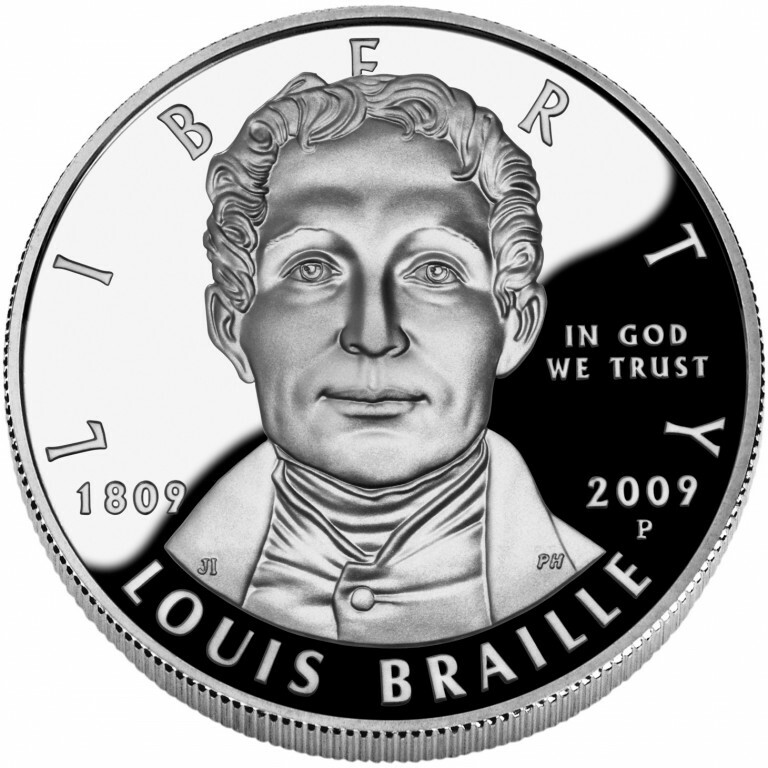 Surcharges from sales of the 2009 Louis Braille Bicentennial Silver Dollar are authorized to be paid to the National Federation of the Blind to further its programs to promote Braille literacy. 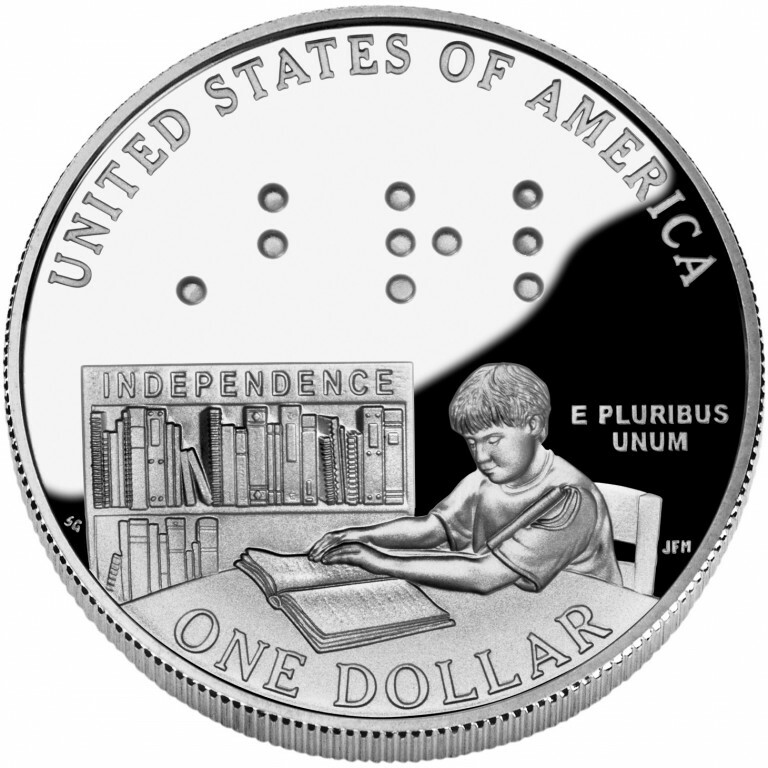 The obverse (heads) features a portrait of Louis Braille, and the reverse (tails), shows a child reading a book in Braille.